In the middle of 2003, the government announced the policy to promote Thailand to be an aviation hub in the Asia Pacific. As the result, the aviation activities have been aggressively expanded. Thus, the aircraft repair and maintenance work has been increased but Thailand has no aircraft maintenance center within the country. Thai government agencies and private companies have to send their aircraft abroad for the costly and time consuming repairing and maintenance services. To cater to the need on the rising aircraft maintenance demand and save the foreign currency for the country, the aircraft repair and maintenance service center has to be established in Thailand. Therefore, on the 23rd September 2003, the cabinet approved the project for the Ministry of Transportation and Royal Thai Air Force (RTAF) to jointly establish the Thai Aviation Industries Company Limited (TAI) with the registered capital of 100 million baht. Two major founding shareholders of TAI are the Office of Small and Medium Enterprises Promotion (OSMEP), 51 percent and the RTAF Welfare fund, 49 percent. Thai Aviation Industries Co., Ltd.’s headquarters at Don Muang started its operation on the 29th January 2004. The company’s aircraft repair services centre at Nakhon Sawan Province was officially opened on the 29th April 2004. The standard of the services is in accordance with the rules instructed by the Department of Civil Aviation. One year later, the company expanded its services to cover the new two maintenance services centres for light aircraft for flight training at the Flying Training School (Nakhon Pathom Province) and Squadron 604, Don Muang. The company also set up the tool and measurement testing and calibration centre in 2005. 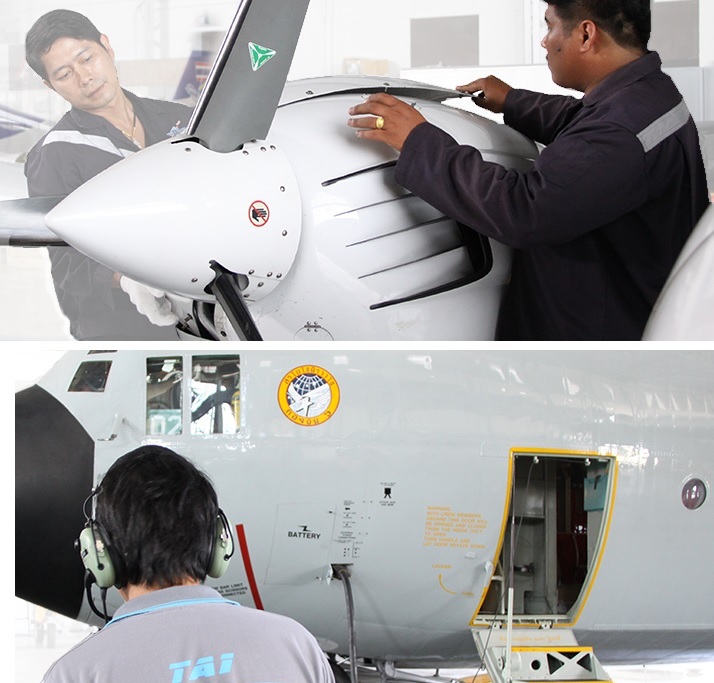 In 2006, TAI, in order to cope with the increasing demand, opened the Piston Engine Repairing Division (Don Muang), Propeller Repairing Division (Don Muang) and Aviation Electronics Repairing Division (Don Muang). At the end of the year, Helicopter Maintenance Centre at Lopburi Province was opened for service. At present, the company has more than 400 experienced engineers and aviation technicians from the Royal Thai Air Force. Light aircraft for flight training: The two service centres certified by the Department of Civil Aviation are servicing the CT-4, PC-9, Diamond DA42-TDI from the level of Flight Line to Depot. Transport Aircraft: The company is currently servicing the medium and large aircraft including C-130, G-222, Avro 748, Learjet 35A, CN 235 and CASA-200. Fighter and Attack Aircraft: The company had expanded the maintenance service capability to cover the fighter and attack aircraft of RTAF i.e. F-16 and L-39. The company is able to upgrade the aircraft and participate in the project to upgrade/update the structure of F-16 as per RTAF’s Falcon UP, Falcon STAR, F-16 MLU scheme. The checking and repairing of structure at Depot Level is also available for L-39. Helicopter: The repairing and maintenance services at all levels for helicopter including UH-1H, Bell 205, 206, 212 and 412 are available. Commercial Aircraft: The company is on the process of expanding its repairing and maintenance capability to cover the small and medium-size commercial aircraft i.e. Boeing 727-200, Boeing 737-300, Airbus 319CJ, Airbus 320 Series, Saab 340B and King Air B200. Repair Station Certificate granted for Airframe Class 1, 2, 3 & 4 . Powerplant Class 1, 2 & 3 Propeller Class 1 & 2. Radio Class 1, 2 & 3. Instrument Class 1, 2, 3 & 4 . Accessory Class 1, 2 & 3 and Specialized Service at Takhli, Nakhonsawan. Repair Station Certificate granted for Airframe Class 1&3. Limited Powerplant and Propeller. Radio Class 1, 2 & 3 at Donmueang, Bangkok. Repair Station Certificate granted for Limited Airframe, Powerplant, Radio and Specialized Service at Kamphaengsan, Nakhonpathom. Certificate of Laboratory Accreditation granted for the Competence of Testing and Calibration laboratories TIS 17025-2548 (2005), ISO/IEC 17025:2005 at Donmueang, Bangkok. Repair Station Certificate granted for Airframe Class 1, 2, 3 & 4 ( for Airbus A320 Series and Boeing 737-300 ). Powerplant Class 1 & 3 and Specialized Service to Non-Destructive Testing & Inspection at Donmueang, Bangkok. ISO 9001 : 2008 Certification from Bureau Veritas Certificate number TH1000516.